I know for the rest of the more seasoned bloggers, you’re all counting by the 10’s, 50’s and hundred’s for your giveaways (which is just amazing); but I must say I’m quite elated that I have 10 followers. Being only 2 and a half months old, I’m quite happy that there are those of you out there that like to read about my various projects and general thoughts. So to say “thank you”, I’m hosting my first giveaway. The first item I’ll be giving away is a bit more than 3 and a half yards of an apparel/quilt fabric by Amy Butler. And as an added bonus, I’ve already prewashed it for you (since I do that with all the fabric I bring into my home). I personally love this fabric. It’s great for all seasons with the bright flowers (for spring/summer) on a darker background (fall/winter) and has a lovely Scandinavian-type design. In addition to giving away this fun and pretty fabric, I wanted to make things even more interesting; and I’m letting you choose your own pattern of the ones below, instead of me choosing one for you. Everyone has their own taste and style, so I really wanted to make my first giveaway as inclusive as possible and let the winner choose. I have a pattern each from the 40’s, 50’s, 60’s, and a current pattern. 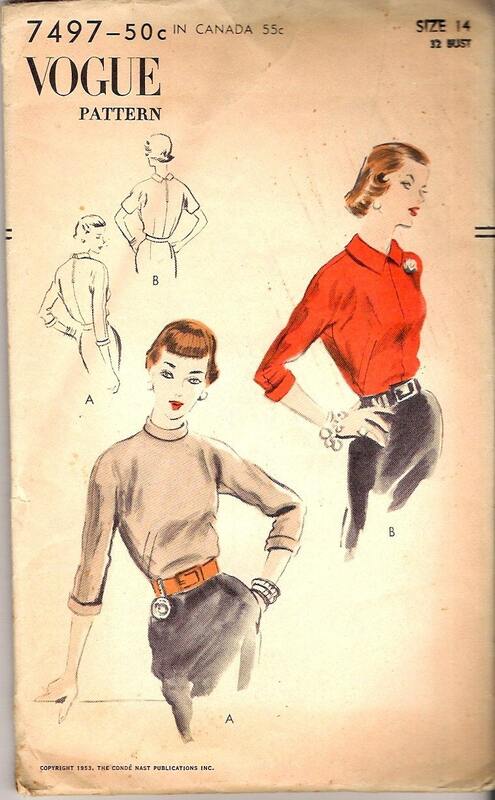 The first pattern I have to offer is a Vintage DuBarry skirt pattern, 1884B in a 26 waist from the 30’s/40’s. It’s an unprinted pattern, and has 10 gores. All the pieces are here, but I bought the pattern used, via etsy. Isn’t it sweet? I think it would look divine with a little vintage jumper, too. Don’t be swayed by the fact that it’s a 26 waist. You can easily add 1/4 inch to all of the pattern pieces at the waist to get it to fit a ‘normal’ non 26″ waist. The second pattern option is Vintage Vogue 7494 in a size 14, or 32 bust. It’s an unprinted pattern dating from 1953. There seems to be a decent amount of ease in the pattern, so if you’re a 34, again don’t be swayed by the fact that it’s for a 32″ bust. 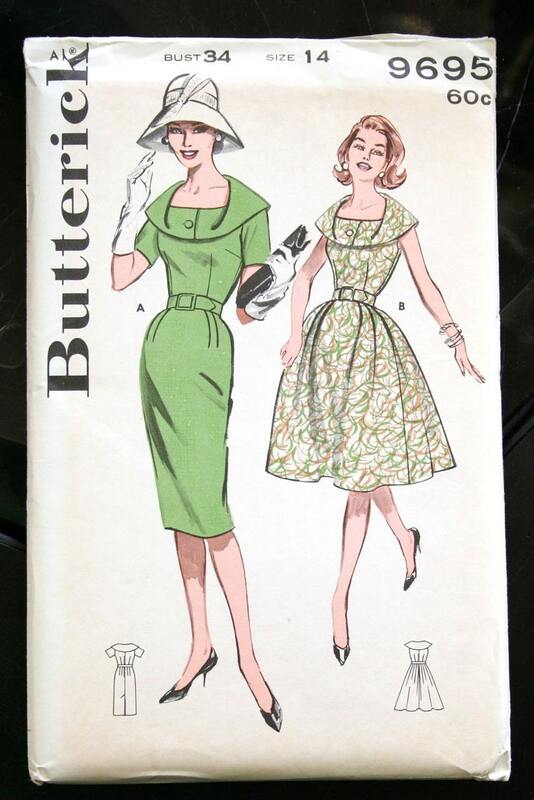 The next pattern I have up for grabs is a Vintage Butterick 9695 which is dated from the early 60’s. It’s for a 34 Bust or size 14. I love the full skirted option, don’t you? And last but not least, I have a modern pattern to offer as well. This one is Amy Butler’s Lotus Tunic and Cami. Isn’t it cute?! Just remember to leave me a comment telling me what you did (we run on the honor system here, my peeps). Good luck everyone! I’ll be announcing the winner in one week’s time, on Friday March 4th. Congratulations! How generous of you to be hosting such a great giveaway. The butterick pattern is great, it has such an interesting neckline. But please ignore my comments if this giveaway is only open to the US. The last thing I want to do is to restrict this to US only. So everyone is welcome! And I’ll count your comment, if you like. Hurry for ten subscribers! I only have 6 so I’m jealous! LOL! I already have you in my Google reader so I’ve posted on facebook and on Twitter (Mighty_Mia). Good Luck!!! Yay! Good Luck to you too. Congratulations on reaching a milestone! I did 1, 2 & 3. Would have done 4, too, but I don’t have an active blog at the moment. Pick me! My favorite pattern is Butterick 9695. Ooh – how much fun. The Amy Butler fabric is lovely! I found my way here from your wonderful purple kick pleat skirt on Burdastyle – it is such a great colour, even before one gets to the kick pleat. I have added your blog to my feed reader (don’t possess possiblities 2,3,or4! ), please take it as an entry to your lovely giveaway – ta! …Aw! Just spotted the bunnies at the foot of your blog page as my comment above published – along with the scooter at the top – it’s very cute! Thanks so much for stopping by my blog. If you click on the bunny at the top, it will take you to some posts about my own bunnies. I love looking at your work, but I’ve sewn so little, I don’t feel worthy of the fabric and pattern! I have some of my very own Amy Butler fabric washed in my basement. Oh how I wish for a 34 bust! The one Amy Butler pattern is for all different sizes… so that would be a good option if you’re not a 34B. Wow this is the best giveaway ever! Love it! You are on my reader already, Please enter me! You are really great at sewing, I am sure you will be getting a lot more followers soon!!! Funny, I thought you *were* on my Google Reader after I first saw you in your Lady Grey coat from the sew-along! I’ve even commented on a couple of your posts :) Well, I’ve added you now, so perhaps you have 11 followers (although I’m sure much more by this point)! Congrats on getting 10 followers in such a short time. I’m following you in my Google Reader. And if I win, I’d LOVE the second last pattern – that unusual collar is so interesting. I’ve always been a fan of big neck details in clothes so this is right up my alley! I think this is, like, the best giveaway EVER!!!! I love the Butterick pattern best and the fabric is LOVELY. Thanks so much. 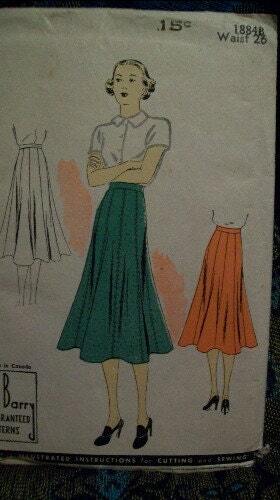 I love the vintage skirt pattern. Congratulations! I have really been enjoying your blog and seeing all your wonderful projects. I follow you on my favorites, I just need to subscribe now so you can have more subscribers. I love the fabric, I really like Amy Butlers, but its a little to rich for my blood. Thanks for hosting the giveaway! Gorgeous fabric! Thanks for the chance to win! I love Vintage Butterick 9695! Hi Liz! I’ve been secretly/jealously viewing your blog and checking your cool new clothes! Maybe someday I will learn to sew, with your inspiration! Just lovely! Thanks for this great giveaway! Love all the patterns and *adore* that fabric!!! I found your blog through the swing dress sew along and your comments re adjusting for a small waist , i subscribed through google reader and then saw the giveaway! Aww, sorry I wasn’t able to include you in this giveaway. It ended at midnight last night so that I could announce the winner this morning. I do plan on having another one in the near future so stay tuned. Are you in the swing dress flickr group?